Sophie Bracinni’s story in the Lamorinda Weekly features an upcoming camp at the Lafayette Community Garden and Learning Center. The Lafayette Community Garden site has everything that’s required to transport one back to the time when men and women lived in harmony with the land, taking only what they needed and feeling fulfilled in return. It lacks only the Lamorindans of 5,000 years ago: the Saclan tribe. Peggy Maglien’s ambition is to take a group of children ages 8-12 (and maybe a few adults) back in time Aug. 12-16 and let them experience what it was like to live connected with nature. The camp, “Meeting Nature Through Miwok Eyes,” is offered through the Lafayette Parks and Recreation Department. 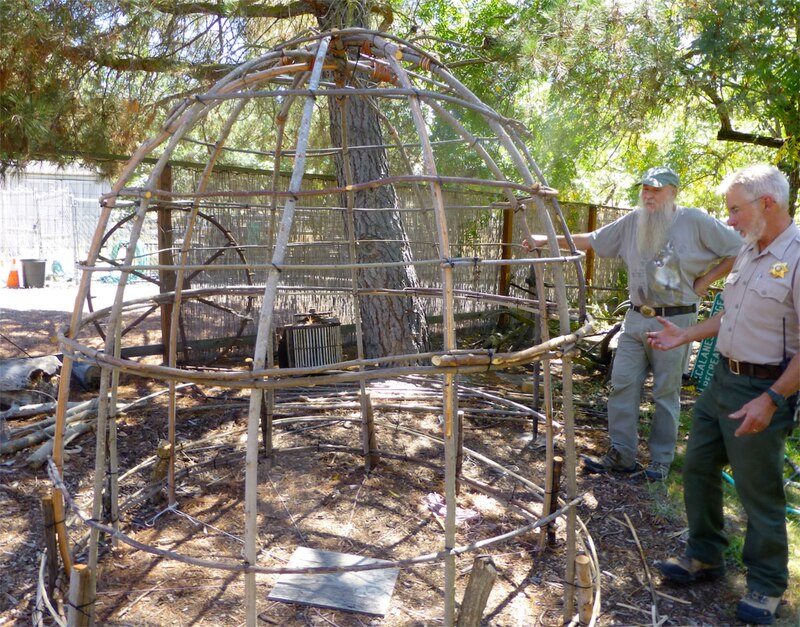 Ranger Bruce Weidman (right) and Doc Hale build a Miwok dwelling at Sugarloaf Open Space. This entry was posted in Community Events, News & Events, Outdoor Learning Center and tagged Miwok, Summer Camp.